We are a duo of hair and makeup artist who have worked together for 10 years. Working together as a team allows us to understand eachother's vision and work seamlessly alongside one another on everything we do. 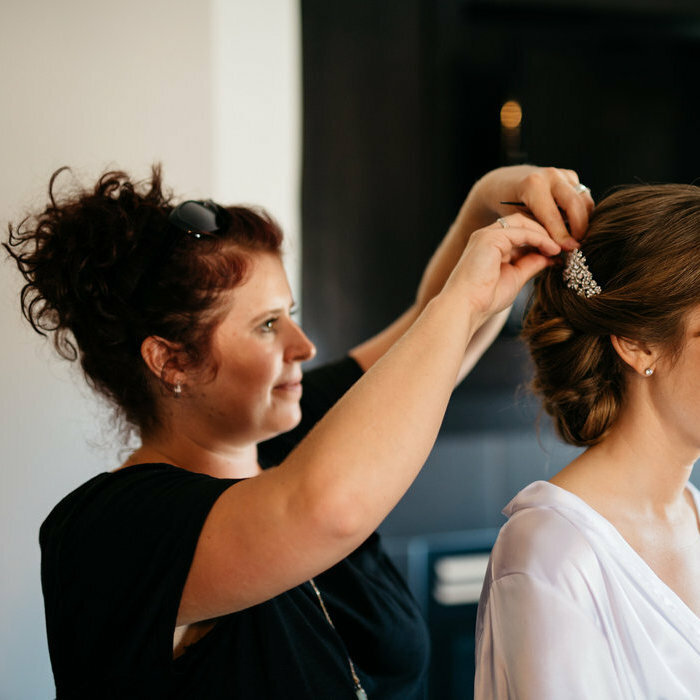 We work with you and are passionate about achieving the hair and makeup look you envision. Gail is a stylist in all aspects of hair design, with more than 15 years of experience and teaching. Her previous work in an active, vibrant salon and training has proven to be very effective in keeping her up to date on the latest techniques and trends, not only in hairstyling but in colour and cutting as well. Through these experiences, Gail has gained a keen eye for the art of hair design. She is motivated by the energy of the industry and creating beautiful hair for any occasion. Gail enjoys the harmony that comes with every element of what she does. Anita pursued her passion for makeup professionally by attending Vancouver’s world renowned makeup school Blanche Macdonald Centre in 2006. She received her Makeup Artistry Diploma, focusing on bridal and fashion makeup. Anita utilized what she learned at Blanche Macdonald Centre and gained further experience and training by having the privilege to work for prestigious cosmetic lines such as Bobbi Brown and Laura Mercier. Much of her talent was taught to her by international and national makeup artists. She continually keeps up with current trends so she can offer her clients the best and most up to date looks. Anita ensures that her clients receive the look they desire and feel beautiful inside and out. Bringing out the most beautiful features and creating different looks, allows her to be creative and adapt to every persons' requests. Especially, working with colours and pigments that complement a person's skin, style and personality. *we have other artists that will join our team on an event basis if we need more creative hands to help.